Living in a city with so many beautiful homes, I get a lot of gratification from driving around town (or walking my dog), and viewing the houses from the street. There are some houses that capture my imagination more than others, and I have an informal ‘house list’ of houses that I would love to see inside. Sometimes I get to ‘see’ the inside of a home on my list when it is listed for sale; I have even been known to go to a real estate agent caravan in order to get a peek into a home on my list. Other times, I am lucky enough to be invited to an event at one of these homes. But, my favorite way to see a home is through a tour of homes. Atlantans are often quite generous in sharing their homes with fellow architecture and design fans, and various charitable organizations have capitalized upon this by organizing tours of homes that benefit a designated charity. I recently learned that there will be a new tour this weekend in Atlanta (10/10/10), presented by Beacham & Company, REALTORS, and benefitting the Special Olympics of Georgia. On this tour are five wonderful homes, all on the market, and several of them are on my ‘list’. It is going to be a great tour! This beautiful house is located inside one of my favorite Atlanta neighborhoods, Kingswood, and is one of my favorite houses in the area. It sits atop a beautiful property, sited perfectly on its lot; I have walked my dog by this house many, many times, and always stop to admire it. When the house went on the market recently, I learned that it had been renovated by one of Atlanta’s premiere architects, Keith Summerour. A glimpse of the interior, which is decorated in pale and soothing tones. This splendid home, designed by Historical Concepts and described as Beaux Arts style, was the 2008 winner of the prestigious Shutze Award awarded by the Southeast Chapter of the Institute of Classical Architecture & Classical America. The house won for the 10,000 square foot and above category (it has about 16,000 square feet!). I have been invited to two events at this home, but was not able to attend either. I am looking forward to finally seeing this home in person! Photo credit for images above: Blayne Beacham. The house I am most looking forward to seeing is ‘The Pink Palace’, built in 1923 and designed by Philip Shutze (recognized as ‘his first house’). Modeled after Villa Cussano in Verona, Italy, this house used to sit on a huge amount of land, and faced West Paces Ferry. Over the years, the owners have sold off much of the land, and the house address is now 3418 Pinestream Road. 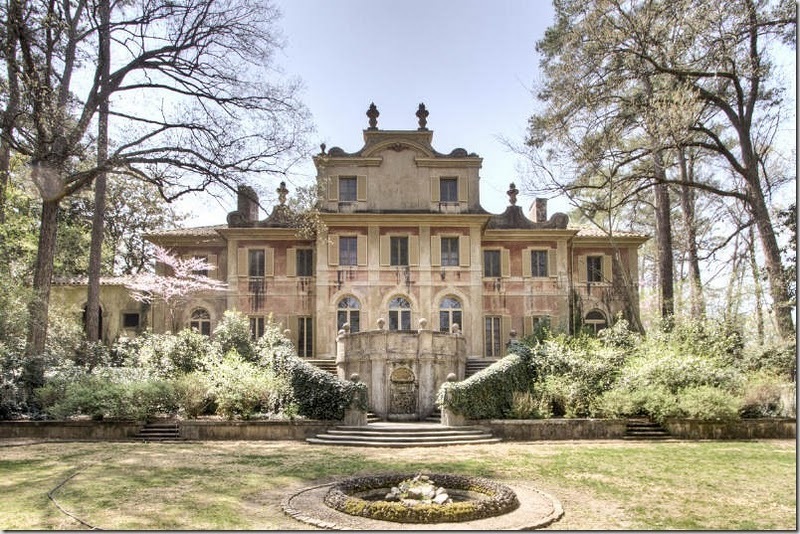 This magnificent Italian style estate is now on the market, and I have heard that most (if not all) of the original Shutze designed architectural features on the interior remain in pristine state, exactly as Shutze designed them. The price of the tour ticket ($25) is worth the price alone to get to see this beautiful part of Atlanta architectural history. To see more pictures of the interior of this house, please visit the real estate listing. For more information on the Tour of Homes benefitting the Special Olympics of Georgia, presented by Beacham & Company, click here or follow this link: http://tinyurl.com/beachamspecialolympicstour. Sunday, Oct. 10, 2010, 1:00 - 5:00 p..m.
$25 entry fee * per person to tour all 5 homes. *Entry fee is tax deductible. Tickets can be bought online or at any of the houses on the day of the tour. I wish I could come! These houses are absolutely magnificent. Can't wait to look at the rest of the interior images. Hope you are well. Wow - what a tour! Beautiful! I love high ceilings in old homes! I am going to drive in from Nashville for this! amazing! what gorgeous homes. what a lovely day it would be to stroll those grounds and take in all that beautiful architecture and design! I'm not 100% sure I'll be there, hope so. I'll be looking for you. and take lots of pics please. Tour of Homes are always so much fun...Have a good time. I wish I could make a trip to Atlanta. All of these homes are over the top gorgeous, but the Pink Palace is unbelievable! Great list of homes! Thank you for sharing the details and for linking to our website, Holly. Can't wait for the tour! Wow, this is the home tour of all home tours! How fabulous, thank you for sharing these images. I only wish I was in the area so I could see them in person!! How much fun to get an inside look at such beautiful properties! I hope you get to take lots of pictures. I love the Shutze house...is that the one with the waterfall down the steps at the back of the house? Wish I were in Atlanta to go on this tour. I love tours of homes and my favorite is house number two designed by Historical Concepts. Have tons of fun looks like a wonderful tour. Wow. Wow. Wow. That is about all that I can say. Gorgeous homes! I wish so badly that I could go! I am seriously contemplating running away to Atlanta just to enjoy all of the beautiful architecture! Wish I was going to be in Atlanta - I can't think of any way I'd rather spend my weekend than touring these homes...fabulous! Everytime you do one of these posts you make me wish I lived in Atlanta. You could say I have an obsession with great interior and exterior design. So disappointed I won't be there to go on this stunning tour -wow -those houses!! Thanks for sharing at least this much with us! I'm going and am very much looking forward to seeing the Schutze house and Summerour's renovation on Habersham. You are going to have the best time! I love house tours...especially of this caliber!!! I would gladly pay $25 to see inside the last one....it's magnificent!!! Amazing! Off to see the real estate listing of that last home..so different than what we have here in the New England area...have a great time! Both are stunning- I wish I could go on the tour because the photos are lovely. I adore the L shape and the pool. Gorgeous!! sounds divine! I would so make the trip if our sunday wasn't so jam packed. These homes give a new meaning to grand. Oh those robber baron years must have been bliss. I would love to go on the house tour, the ceilings are so incredible. Can you imagine how much fun a ballroom would be? Oh how I wish I lived closer. This home tour would be amazing. I was lucky enough to go on a home tour this last weekend in Pasadena, Ca. They had some pretty amazing homes on this tour. I will be writing about them this weekend. People are so gracious to open their homes for these tours. Holly, I would love to join you for an Atlanta house tour someday! I love a home tour....I've implemented in my on home various things I've seen in other homes. And, if only I lived in Atlanta...that first home would feel like "home"! Stunning houses! Makes me wish I could get away to Atlanta this weekend. I am going to try and squeeze this in before heading to see the Braves play! Thanks for posting about this. If it weren't for you I would never know about most of these tours. The ceiling in the living room of the Pinestream Road house absolutely blows my socks off! GORGEOUS! These homes are all so amazing. Thanks for sharing them! Wish I could be there to do the tour, as well! So glad to see that the Gilded Age lives on in the south! Seeing these always reminds me of Snow White - sing and dance and throw open the windows to let in the day! (I seem to remember that hers were in swings...). Just beautiful examples. You outdid yourself - spoiled for inspiration here! Love your choices of houses, they are absolutely beautiful and feel like homes.